Founded in 1958, Craig Tools, Inc. manufactures rotary cutting tools used in aircraft assembly. The majority of the company’s sales are through distributor channels; a smaller portion is directly to OEM’s such as Boeing and Airbus. 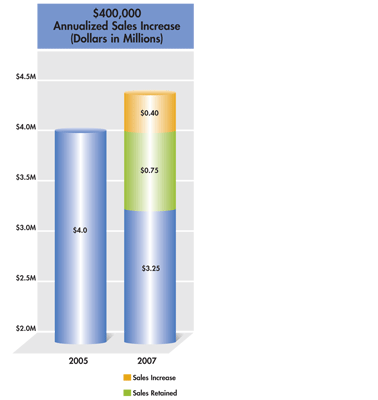 The annual sales were at $4 million in 2005. The manufacturing facility located in El Segundo, California, employs 28 people with a diverse workforce. The company also owns a manufacturing facility in Tecate, Mexico. In August 2005, representatives from CMTC® met with the management of Craig Tools to discuss the company’s interest in implementing a quality system compliant to ISO 9001:2000. The management team concluded that a sound business management system would improve the internal processes and maintain their high quality levels. In addition, third party registration of their quality system would improve their customer retention program and expand their marketing opportunities leading to a potential increase in sales. CMTC and Craig Tools agreed on a project plan to provide the necessary technical support and consulting services to enable Craig Tools to implement the quality management system. The project tasks, which included both internal training and handson facilitation, began in October 2005. A particular highlight was when the newly trained internal audit team revealed several quality improvement areas that were immediately addressed by the responsible managers and supervisors. By the end of the project in March 2007, Craig Tools had achieved third party registration to ISO 9001:2000, reported increased efficiencies and reduced reject levels. Since the implementation of the new quality system, there is clearer definition of responsibilities for quality and the means to control it. Accurate management information of quality performance in all areas of the business has resulted in reduced waste and rework. Registration to ISO 9001:2000 has also resulted in increased sales and has assured retention of existing sales. As a result of this project, Craig Tools increased their investment in equipment and employee training by $47,000. Sales have increased by $400,000 and sales retention is valued at $750,000. By using CMTC, Craig Tools estimate their cost savings to be $40,000. "We are very happy with CMTC’s performance."